In this view of the InSight probe on Mars, the heat mole instrument is the black vertical cylinder toward the left. WASHINGTON — NASA's Mars InSight lander has settled into its new home on Elysium Planitia and is preparing to deploy its instruments — and if all goes well, one device's work should be complete by March. 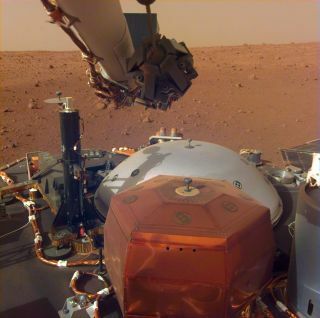 That instrument is InSight's self-hammering heat probe, nicknamed the "mole," which is designed to measure heat production and flow within the interior of Mars. To do that, the instrument has to drill down about 16 feet (5 meters) into the Martian regolith — and that procedure is currently scheduled to begin in January, the mole's principal investigator said yesterday (Dec. 11) during a presentation at the annual meeting of the American Geophysical Union. The heat probe needs to wait its turn, with the lander's supersensitive seismometer and its protective shielding being deployed first. That process will take about a month and is scheduled to begin next week, Spohn said. If that goes well, the heat probe will be the next to move, with deployment beginning in mid-January. The drilling process will take about two months, since the probe regularly stops to produce a burst of heat and measure how that heat moves through the rock at its current depth. What worries Spohn is that a large rock — 3 feet (1 m) in diameter or so — would stymie the probe's drilling mechanism, which relies on pushing aside dirt. Smaller rocks it can either push aside or burrow around, and has demonstrated that ability during tests in rock chambers here on Earth. If a blockage does occur, how far the probe has managed to travel will determine how helpful the results are to scientists. "The less we penetrate, the worse it will be," Spohn said. If it's just 3 feet (1 m) or so deep, the team will need to rely on more intensive modeling. But if it reaches 10 feet (3 m), which should occur around mid February, the team will be pleased — and if it can reach the full depth of 16 feet (5 m) around March 10 or so, all the better. Spohn is pleased with InSight's landing site, which is just as flat and rock-free as scientists were hoping for. "We had a lot of luck, we have to say," he said, noting that the robot touched down near — but not inside — a crater. "Had we landed there we would have been in some trouble."